An online Associate in Religion degree is right for you if you are keen to pursue a qualification in spirituality or religion. There are numerous top colleges and universities offering such degrees with the aim of exposing students to the subject of religion. You can most certainly choose a subject to focus on depending on your interests or religious beliefs. Most institutions cover Christianity, Islam, Buddhism, Hindu and Judaism. By graduating with this degree, an individual automatically qualifies for entry into a bachelor’s in philosophy, theology or other programs that allow a background in religion. An associate in religion program prepares one for ministry work. If you like volunteering in church work or organizations, you might find fulfillment by working towards this degree. Liberty University offers the Associate of Arts degree in Religion online. The degree is intended for any individual who seeks to deepen their faith as well as for pastors who would like to add to their knowledge in Christian theology, the Bible, the church and Christianity. Students develop written and oral communication skills that are necessary in any professional or personal ministry. They are taught how to apply the Bible to contemporary issues. The degree entails a total of 60 credit hours, 15 of which must be covered at Liberty. Those that have successfully completed the program may seek further education by enrolling into a Bachelor’s program or begin careers in Social Services, Missions, Religious Committees and Local Ministries. Applicants of the program are required to submit completed applications with a $50application fee; request for sealed official transcripts from high school or colleges attended, to be sent directly to Liberty University. The university is accredited by the Southern Association of Colleges and Schools Commission on Colleges (SACSCOC). Campbell University offers individuals who wish to serve in the Christian ministry an opportunity to study online for an Associate of Arts degree in Religion. They are required to complete 18 semester hours of religion concentration as well as electives and general education core courses. The curriculum explores the Old Testament, New Testament, Christian Ethics, World Religions, Church History, Basic Christian Beliefs, Lifetime Wellness, Western Civilization, Academic Writing, Christianity and Fine Arts. Anyone seeking to join the program as a transfer student must request for official transcripts from high school or college attended. All students are expected to complete at least 62 semester hours prior to graduation and attained a minimum GPA of 2.0. Campbell University is a military friendly school where those on active duty and veterans get the support they need to find a course and education that is fulfilling to them. The university is regionally accredited by the Southern Association of Colleges and Schools Commission on Colleges (SACSCOC). 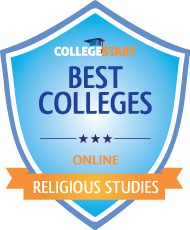 Oakland City University is a leading institution where students get to study for Associate of Arts in Religious Studies online. Through the program, students acquire knowledge that will help them manage entry-level roles in church ministry, Christian Education, denominational services and missions. Students study the influence that Christianity and the Bible have on western civilization. They are taught values, ethics and morals of Christian leaders.The university seeks to enhance the Gospel of Jesus Christ through the programs offered. The degree program is not only open to Christians but to students of other faiths. The AA in Religious Studies program comprises of 60 credit hours and can be completed in 2 years. Online students will have access to quality education, learning materials and support from faculty and advisors. The university is accredited by the Higher Learning Commission of the North Central Association of Colleges and Schools (HLC / NCACS). St. Louis Christian College offers the Associate of Arts in Religious Studies online. The program gives students the academic foundation necessary in case they wish to pursue a Bachelor of Science degree in Christian Ministry (BSCM) in the future. The two years of study taken during the Associate of Arts program are the equivalent of the first two years of the BSCM. The curriculum covers General Education, Practical Ministry and Biblical Studies. By taking this course, students develop critical thinking and communication skills; the ability to comprehend what the Bible says; ability to explain what the Christian Faith is all about and the ability to spread the word of God. The following are some of the courses taken; Old Testament and New Testament Survey, Christian Theology, Hermeneutics, Christian Ethics, Church History, Introduction to Life Science, Introduction to Ministry, Introduction to World Missions and Evangelism & Discipleship. SLCU is accredited by the Commission on Accreditation of The Association for Biblical Higher Education (ABHE). Belhaven University is the one place where you can study for an Associate of Arts in Biblical Studies online. The program prepares students to serve in the ministry and for further education should they wish to enroll for a Bachelor’s degree. They cover a variety of topics in the courses offered including Old Testament and New Testament History, Civilization, Science and Culture, Christian Interpretation of Life, Law Books and Wisdom Literature, Israel’s History, Gospel & Letters and Non Profit Administration. Students who’ve enrolled into online studying are frequently in contact with their professors and continue to receive support from the university’s online staff. They’ll acquire a Christian Worldview that they can apply to real life issues and one that’ll help them understand cultural trends better. Belhaven University is accredited by the Southern Association of Colleges and Schools Commission on Colleges (SACSCOC). Colorado Christian University gives individuals the opportunity to study for an Associate of Arts in Biblical Studies online. The curriculum encompasses theology, introduction to biblical studies, liberal arts and Christian doctrine. In the AA in Biblical Studies, students will explore the Old Testament and its interpretation as well as the message in the New Testament and its significance. They learn Christian beliefs and doctrines such as the Trinity, Reconciliation, the Church, Revelation and Creation. They also become aware of biblical languages and different research tools that they can use to study or read biblical texts. The degree consists of 60 credit hours and can be completed in just 2years. Applicants with military, college or technical credits may transfer those to the degree. Up to 45 credit hours can be transferred from an accredited college or university. Colorado Christian University is accredited by the Higher Learning Commission of the North Central Association of Colleges and Schools (HLC / NCACS). The Southeastern University offers students the opportunity to enroll for an online Associate degree in Ministerial Leadership. By taking this major, students will build and expand their skills in ministry. Theygain extensive knowledge of Church ministry, the Bible, leadership principles and spiritual development. They’ll study Principles of Ethics;Holistic Disciple-making;Theology of God and Humanity, Christ, Culture and the University; Old Testament and New Testament Survey; Theology of Salvation, The Church, and Eschatology; Christian Spirituality and other courses. The degree constitutes 60 credit hours. Graduates of the Ministerial Leadership program may begin careers in Non-Profit leadership or Church Leadership. They may alternatively pursue further education in Theology and Biblical Studies. Applicants of the program are required to submit official high school or college transcripts alongside biographical essays and personal reference forms. The university is accredited by the Southern Association of Colleges and Schools Commission on Colleges (SACSCOC). Grace Bible College is one of the colleges offering Associate’s in Religion courses. It has the Associate of Arts in Leadership and Ministry program where students are taught how to interact with the world, add to their ministry skills, grow spiritually and make use of the bible in all situations of life. The curriculum combines theory and practical knowledge to offer students optimal experience. It emphasizes ministry skills, teaching, preaching and leadership. Students take classes such asPhilosophy and Worldview, Empowerment Coaching, Financial Stewardship, Sharing & Defending in the Christian Faith, Leadership and Ministry Capstone, Issues in Christian Leadership and Discipling& Mentoring in the Christian Faith. The college admits students from different cultures and ministry backgrounds. Application to the program is completely free. Applicants must request for official transcripts from institutions they’ve previously attended and also submit a ministry reference. Grace Bible College is accredited by the Commission on Accreditation Association for Biblical Higher Education (ABHE). Trevecca Nazarene University is one of the places where you can study online for an Associate of Arts degree in Christian Ministry. The curriculum offered focuses on Mission Vision, Competence in Ministry, Holistic Mindset and Servant Leadership Skills. The university’s mission is to prepare students with the right education, skills and tools that will help them be efficient in the ministry. Earning this degree is your first step towards a successful and fulfilling career. Students will take core classes as well as additional courses in General Education. Examples of the classes are Christian Education, Shepherding the Congregation, leadership in the Christian Organization, Compassionate Ministry, Communication & Technology for College and Fundamentals of Business. As for Admission, students will be required to submit official high school transcripts or GED certificates. They should also be computer literate and have computer access throughout the course of the program. The university is accredited by the Southern Association of Colleges and Schools (SCAS). Regent University is one of the established colleges offering Associate degrees in Religion. It has the Associate of Arts in Christian Studies degreeprogram which you can study for online. Enrollment into the program is open to anyone who has an interest in biblical studies or Christian ministry. Students will explore topics such as missions, ministry, world religions and theology. They are taught the places, key figures, themes and events of both the Old Testament and New Testament. The program prepares students for Christian Leadership roles in Human Services, Ministry, Nonprofit Organizations and Missions. Students are required to complete 64 credit hours before they can graduate. Some of the courses taught through the program include World Religions and Cultures, Christian Ministry, Mission and Message of Jesus, Principles of Theology and Teaching / Studying the Bible. Regent University’s accreditation is by the Southern Association of Colleges and Schools Commission on Colleges.